I was nominated for a Leibster Award by the lovely Cherelle from Reading in Peace! It’s really nice to know someone thinks highly enough of my blog to nominate me so thank you so much! 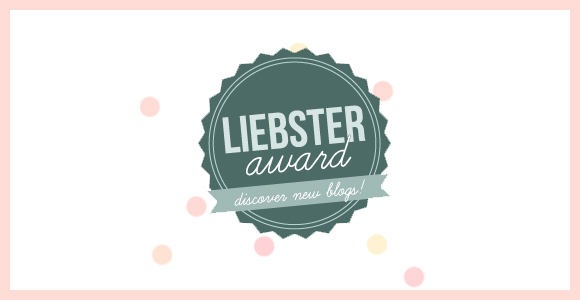 For those who don’t know, a Leibster Award is an online award bloggers give to other new (or relatively new) bloggers that they like and is a way to recognise those with fewer than 200 followers (the rules always differ but that’s the general idea!) The person who nominates you will provide 10 questions for you to answer then in your post you answer the questions, nominate your favourite bloggers and ask them a set of 10 different questions which they then answer and so on. I think it’s a lovely idea because we all know how hard it is being a newbie blogger in a world where thousands of people are doing exactly the same thing as you! Here are my answers to the questions Cherelle asked me. They’re great questions and took a lot of thought! Sorry for rambling! 1. Who is your all time favourite book boyfriend? Will anyone judge me if I say Christian Grey? Yep? Ok then. I’m kidding. I’ve not actually read many books with strong male characters in (from what I can remember anyway) so I’m just going to pick someone who I really warmed too and that was Reggie from The Naughty Girls Book Club. My reasons for this is because firstly, someone posted a photo on Twitter of Andrew Garfield and said that he should play Reggie in the movie and from that point on all I could see was Andrew Garfield with messy hair and glasses (ugh!) Reggie is such a sweet character than opens up so much throughout the book and really finds himself. 2. Have you ever started a book and not been able to finish it? If so what was it? I have unfortunately – it was Natural Causes by James Oswald. I always try and finish books even if I don’t enjoy it but I got about 100 pages in with the one and felt like hanging myself from the rafters. I was surprised though because it’s a crime novel and that’s one of my favourite genres so I was really disappointed but I just found myself really having to concentrate on every single word I was reading. It didn’t flow very well and I didn’t understand what was going on the majority of the time. There were names being flown about all over the shop and I didn’t know who anyone was! 3. Who is your role model/inspiration? This was a difficult one because to be honest, I don’t really have that one person who I completely look up to but if I had to chose, it’d probably be someone like Emma Watson. She hasn’t gone off the rails like most child stars these days (Amanda Bynes and Miley Cyrus anyone?) and she seems like a genuinely lovely person and despite being one of the richest 23 year olds in the world she isn’t stuck up or a diva. I also admire her for packing her bags and moving to America on her own to go to college after the Harry Potter movies finished. It’s great that she cares about her education and it’s an incredibly brave thing to do so hats off to her! 4. If you could meet any fictional character, who would it be and why? I would love to meet Charlie from The Perks of Being a Wallflower (in fact, I’d like to meet all of them!) He’s so sweet and I think he’d make you see the world completely differently to how you saw it before. He also loves books so I don’t think we’d be stuck for conversation! 5. Where is your favourite place to read? Anywhere! In bed or in the bath if I’m at home or on a sun-lounger if I was on holiday. I can remember getting through my fair share of books whilst in foreign countries! 6. If you were stuck on a desert island what 2 books would you take with you? I’d probably take The Fault In Our Stars because I can imagine feeling a bit lonely and numb if I was stuck on an island on my own and that never fails to open up your emotions and probably Lord of The Rings because I’ve always wanted to read it and it’s really long so it’d keep me occupied for a while! I’d love to visit Thailand and then go to the island where The Beach was filmed because it looks like paradise and it’s always been a lifetime ambition of mine to go to Norway to see the Northern Lights – they’re so beautiful and magical I can’t even begin to imagine what it feels like to see them. 8. What is your favourite TV program? Oh no I have loads! I’m currently watching Breaking Bad and that’s amazing! I also love Prison Break, LOST, Desperate Housewives and One Tree Hill but you can’t beat a good F.r.i.e.n.d.s episode! 9. If you could choose, what book would you like to see made into a movie? The Age of Miracles by Karen Thompson-Walker. I love that book and I think it would translate brilliantly onto the big screen if they got it right! Or maybe a Cecelia Ahern book like The Book of Tomorrow, A Place Called Here or Time of Your Life – they’d make very different and interesting films I think! 10. What is your favourite genre to read? I think crime/thriller is my favourite. Something with a bit of suspense that keeps you guessing with a nice big twist at the end! Now it’s time for me to nominate who I think deserves the award! I know some of the people I’ve chose aren’t that new to blogging but nevertheless I think they all deserve it so here’s my nominations and a little explanation as to why I chose them! Charlotte from www.miscrawl.wordpress.com. She’s one of the first people I followed when I started blogging and I remember emailing her and asking for some advice on how to get my blog noticed. She’s a lovely girl and her blog covers a range of things from book reviews to general rants so it’s definitely worth a follow! Laura and co. from shelovestoread are my second choice. I’ve spoken to Laura a bit recently on Facebook and really opened up to her about some personal problems which she kindly helped me with and shared her story with me too. Her blog is really girlie and pink so of course, I love it but it’s also quite professional with author interviews and profiles. Next is Megan from readinginthesunshine. Megan is one of the loveliest people I know from blogging and Twitter – she’s always so kind to everyone! I love her blog and her reviews too, they’re always consistent and she clearly puts a lot of effort into her blog. Lastly I’m nominating my (real life) friend, Mike and his blog grungernews. Mike runs a music review blog and you can tell he really knows what he’s talking about because all his posts are lengthy and in-depth about whatever he’s talking about. Mike’s been passionate about music for as long as I can remember and is quite new to blogging so that’s why I think he deserves it! 1) If you could only listen to one band/singer for the rest of your life who would it be and why? 2) Which 4 celebrities would you invite to your dream dinner party and why? 3) What movie adaptation do you think has been truest to their book and why? 4) If there was a movie made about your life who would you want to play you? 6) Do you prefer events to be planned right down to the smallest detail or do you like to go with the flow? 7) If you could move anywhere in the world for the rest of your life, with money not being an issue, where would it be and why? 8) Who is your role model/inspiration? 9) Which TV show could you watch over again without getting bored? 10) What would be your weapon of choice/tactic if you were chosen to go in the Hunger Games? Aren’t ya sweet! Struggling to think of answers to your questions, so thanks for that! Hahah sorry :3 Can’t wait to see your answers!